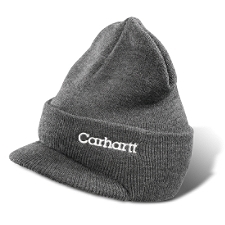 Carhartt Knit Hat with Visor. Our knit hat with visor offers the warmth and the one-size-fits-all versatility of a knit pull-on plus the ability to shade your eyes from bright sun or snow. Durable and comfortable, it’s made of 100% acrylic, stretchable rib-knit fabric, and features the Carhartt logo embroidered on the front.